When the weather turns summery, what could be more refreshing than a Greek salad, French style? It’s been so hot here in Paris recently that I’ve made several. All you need is feta, tomatoes, a cucumber, a red onion, some black olives and a little parsley or mint. Unlike the Greek version, salade grecque is generally served in France without sweet peppers or oregano, and with rosé instead of retsina. Call it an Adriatic of the mind. 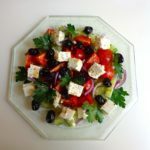 When researching this post, I got to wondering why this particular combination is known as Greek salad, when there are many salads in Greece, my favorites (other than the above) being taramasalata, known in France simply as tarama, made of salted cod roe, oil and bread, and tzatziki, made of cucumbers, yogurt and garlic. I didn’t find the answer, but I did find quite a bit about one of the main ingredients of salade grecque, the cucumber. It turns out that cucumbers came to Greece, and then on to the rest of Europe, from the foothills of the Indian Himalayas, where they grow in the wild. One thing that surprised me when I got to France was the shape of cucumbers here — they are smooth and very long, about 16 inches (40 centimeters), quite unlike the shorter, nubbly cucumbers I had encountered in the United States. One can only speculate on why the French prefer the longer variety, which, oddly, is known here as hollandais (Dutch). Suffice it to say that other varieties have begun appearing at Parisian farmer’s markets and grocery stores, including the suddenly popular short cucumber known as libanais (Lebanese). Getting back to the present day, one delightful thing about Greek salad, French style, is that it can be prepared in advance and refrigerated. It stays crisp if you wait to add the vinaigrette until just before serving. This salad can be served as a main dish at lunchtime or as a starter in the evening, followed perhaps by grilled brochettes of lamb or chicken (coming soon), or — if you’d really like to conjure up the seaside — grilled squid with garlic and parsley or Mediterranean-style fish with tapenade. Other hot-weather suggestions can be found in the Menus section, which I update from time to time according to season. Off the top of my head, summer meals could include: salade niçoise, aïoli (fish and veggies with garlic mayonnaise), assiette de crudités (veggie platter), assiette anglaise (cold roast meat platter), ratatouille, eggplant gratin or cucumber soup. The main idea being to spend less time in the kitchen than at the beach. Happy summer, and happy cooking. This entry was posted in Uncategorized and tagged concombre, cucumber, greek salad, recette, recipe, salade grec. Bookmark the permalink. Good article and nice plate under that salad. For hot weather refreshingness, I’ve always gone for gazpacho. I’ll be making a batch up at Tom & Gayle’s ranch this weekend. Ingredients will be determined by what’s available at the farm stands on the way up to Columbia. Do you have a good recipe for that summer treat that you could share? Hi Benny. Yes, gaspacho (French spelling) is on the menu for this summer. I have a dynamite recipe passed along by someone I’ve known for (gasp!) 64 years, and will probably post it at some point in July. Glad you noticed the plate. It’s one of my favorites. The Greeks don’t call it Greek Salad, they call it choriatiki which means rustic or village salad. In my experience, they are not sticklers for exactitude or authenticity in their recipes so you might well find things like green peppers, capers, oregano etc. in your salad choriatiki, or not as the case may be. Even the retsina isn’t compulsory – but nice, in my opinion anyway. We get those little cucumbers in our local Turkish supermarket here in England.